The Qualcast Suffolk Punch P17SK Petrol Cylinder Lawnmower is capable of an impressive 43cm cutting width, allowing you to mow larger lawns in less time. Fitted with the option of a self-propelling drive, the Qualcast Suffolk Punch P17SK Petrol Cylinder Lawnmower will allow you to cut grass with ease and efficiency. Equipped with a powerful Kawasaki engine, the Qualcast Suffolk Punch P17SK Petrol Cylinder Lawnmower boasts a diminished rate of emissions and is friendlier to the environment as a result. A generous 40 litre grass collector takes cuttings as you mow, removing the need for a tedious tidy up afterwards. The Qualcast Suffolk Punch P17SK Petrol Cylinder Lawnmower is fitted with a highly robust steel roller for ease of positioning. 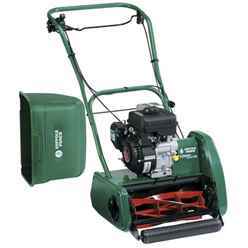 The roller also provides the option of creating classic lawn stripes, enhancing the resplendent beauty of your garden. The manufacture of the Suffolk Punch 17SK has been taken over by Allett Lawnmowers, a quality British manufacturer, with the price, design and specifications remaining exactly the same.